The Olympus TG-830 iHS has been dubbed the life-proof camera, and it definitely lives up to its name. The TG-830 is waterproof, dustproof, shockproof, crushproof, and freezeproof, while performing flawlessly under any and all of the above conditions. Best of all, it doesn't compromise performance in its attempts to be indestructible. For a camera that's not marketed as top-of-the-line, the TG-830 excels in durability and still manages to take pretty good photos. Additional features like GPS and e.compass make the TG-830 an even more attractive buy than other cameras in its class. 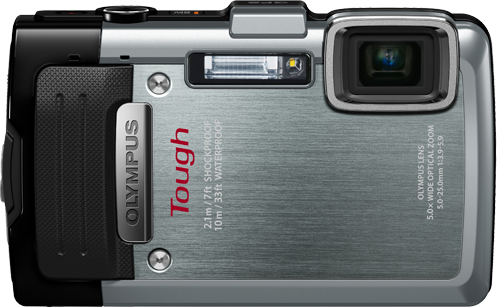 The TG-830 looks like any regular camera, albeit a bit more rugged. The front of the camera has a corner lens accompanied by a flash. The back of the camera features a 3" LCD screen with assorted buttons for navigating the menu, applying settings, and playing back video. The top of the camera holds the power, shutter, and record buttons, while the side hosts the SD card slot. The camera itself is a little hefty at 7.5 ounces, but has a relatively compact form factor. The camera has a grip that may be difficult to hold for some people, as well as a double locking door mechanic that protects the internals, but is often tedious to use. The TG-830 can record high definition 1080p video. At 1080i the frame rate increases to 60fps in exchange for a small drop in quality (the "i" stands for interlaced, where the video plays 30fps footage in two separate passes, creating a sense of motion). The camera can record 720p at 120fps and QVGA (320x240) at 240fps for high speed slow motion video. Photos make use of the 16 MP CMOS sensor to come out sharp and clear. The lens features a 5x optical zoom which can cover a range of 25-125mm. The variable aperture of f/3.9-5.9 will work well enough in bright settings, but will struggle in darker environments (for comparison, an f/2 lens catches about 4x the amount of light). The camera provides a wealth of recording options including face recognition, digital zoom, bust mode, several image modes, and basic image stabilization. The battery lasts slightly over an hour of continuous video recording, which wouldn't be so bad if it didn't mean having to deal with the TG-830's awkward double locking door. The battery is replaceable, and it wouldn't hurt to carry multiples if you're going to be out for a while. The TG-830 performs very well with a start-and-shoot time of 1.4 seconds. The camera supports two burst modes: a high speed mode that captures 16 frames at 10fps, or a mode that captures 2.5fps continuously. There's a minor issue with the camera's video which temporarily shakes after the focal length is adjusted, but disappears after a period of time. The TG-830 features a GPS module which saves location and landmark information to images and videos. Combined with its e.compass functionality, you can track your route using Google Earth and Picasa. The TG-830 supports a myriad of options for adjusting and editing photos, as well as a panorama mode. The camera comes with a hand strap with additional straps, mounts, cases, and tripods available through Olympus' store. For a mid-range camera, the TG-830 has a lot to offer. In addition to its indestructible design, the included GPS and relatively high image quality make this camera a treat.